Steve Bannon, Donald Trump's former chief strategist, has tried to reverse remarks in which he called the president's son Donald Jr "treasonous". The accusation appears in Michael Wolff's new book Fire and Fury: Inside the Trump White House. He was referring to a meeting in June 2016 between Mr Trump's son and a group of Russians. But on Sunday Mr Bannon said the barb was directed at former aide Paul Manafort, who was also present. The Senate, House of Representatives and a special counsel are all investigating alleged Russian interference in the presidential election, allegations denied by both the Kremlin and Donald Trump. In a statement first reported by news site Axios, Steve Bannon called Donald Jr "both a patriot and a good man". "My comments were aimed at Paul Manafort, a seasoned campaign professional with experience and knowledge of how the Russians operate," he said. "He should have known they are duplicitous, cunning and not our friends. To reiterate, those comments were not aimed at Don Jr."
The original remark, published in Mr Wolff's book Fire and Fury: Inside the Trump White House, and not disputed by Mr Bannon, appeared to take aim at all three Trump campaign officials in the room, including Donald Jr. It read: "The three senior guys in the campaign thought it was a good idea to meet with a foreign government inside Trump Tower in the conference room on the 25th floor - with no lawyers. They didn't have any lawyers. "Even if you thought that this was not treasonous, or unpatriotic, or bad s***, and I happen to think it's all of that, you should have called the FBI immediately." 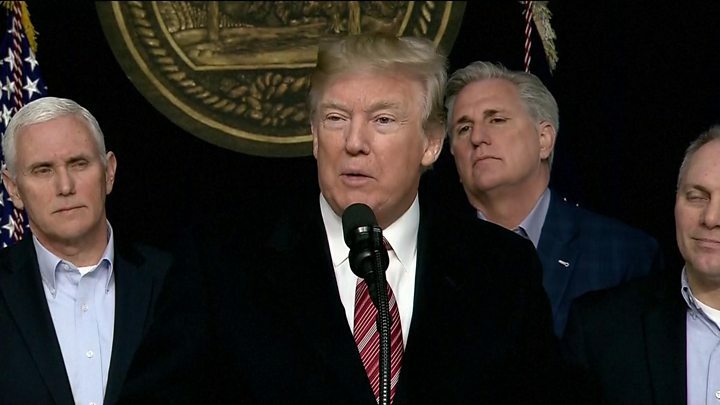 Media captionPresident Trump: "I consider it [the book] a work of fiction"
Mr Bannon's attempt to clarify follows repeated denunciations by Mr Trump, who dubbed him "Sloppy Steve" and said his former aide "cried when he got fired". 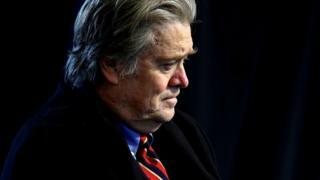 It also follows the loss of the main financial backer of his conservative Breitbart website, heiress Rebekah Mercer, who said in a rare public statement that she had cut off Mr Bannon from funding following his remarks to Mr Wolff. Mr Bannon went on in his statement to say he regretted waiting five days to say something, and called Mr Wolff's reporting "inaccurate". Fire and Fury rocketed to the top of the Amazon bestseller list upon publication last week and became the talk of Washington DC and beyond. Based on first-hand reporting at the White House and, according to the author, more than 200 interviews with top administration figures and others, it portrays the president as impatient, unable to focus and with no interest in reading or attempting to understand policy. It also raised doubts over his mental fitness for office, quoting senior officials who allegedly called the president "mentally unfit", and "idiot", and "like a child". Mr Trump responded by tweeting that he was a "very stable genius" who was "like, very smart". Who is author Michael Wolff? Senior Trump administration officials rallied around the president over the weekend, attempting to mitigate the fallout from the book. CIA chief Mike Pompeo told Fox News Sunday the portrayal was "pure fantasy". He said: "The president is engaged, he understands the complexity, he asks really difficult questions of our team at the CIA." Policy adviser Stephen Miller told CNN Mr Trump was a "political genius" and branded Mr Wolff "a garbage author of a garbage book". Defending himself on NBC, the author said he had no anti-Trump agenda when he began the project. "I would have been delighted to have written a contrarian account here," he said. "'Donald Trump, this unexpected president, is actually going to succeed.' Okay, that's not the story. He is not going to succeed. This is worse than everybody thought." Who is behind explosive book?